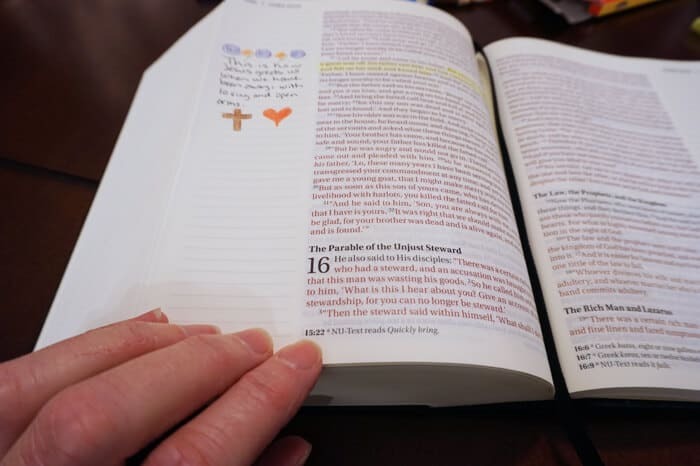 NKJV Journal the Word Bible - A Review & Giveaway - Girl, Just DIY! My faith is at the root of everything I do, it’s as much a part of me as anything else in my life. I’ve been through a few major transitions in the past few years and my faith in God is what got me through them, with my sanity. Life isn’t perfect and even when it’s really tough I know that my God is there to hold me up. 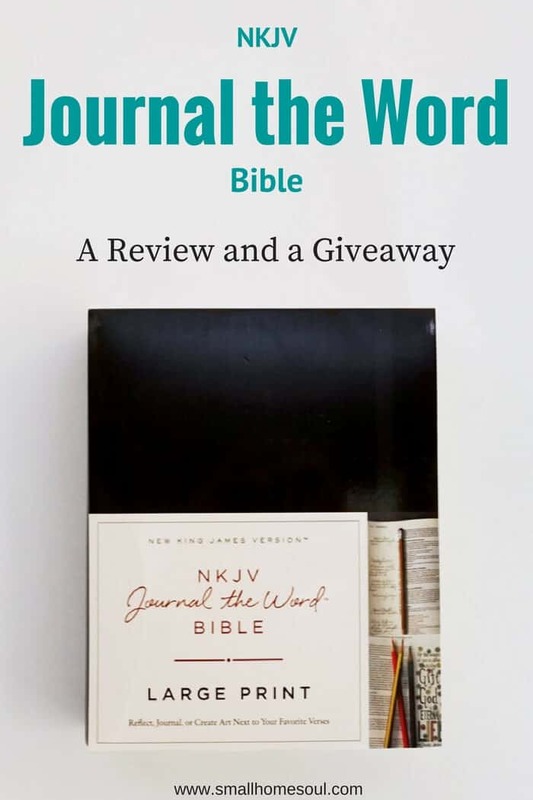 I was provided this NKJV Journal the Word Bible (and one for the giveaway) by Thomas Nelson Bibles in exchange for a review. As always I will give my honest opinions for anything that appears on my blog. I’m also very happy that one lucky reader will get a free Bible of their own. Look for more information in the signup below. Did you know that the average American household owns 4.4 Bibles? Since we’re such a diverse society with different religions and beliefs I guess that would be American Christian households. That number might seem high but a Bible is a very personal thing and every person in the house might have their own copy. The church I grew up in didn’t encourage us to actually read the Bible. The one we had was always on a little wooden stand. It seemed more of something to be looked at and admired than to be studied and consumed. I remember looking at the pretty illustrations when I was young but no one in my family ever actually read the Bible. So writing in it wasn’t even a thought. Thankfully as an adult I learned that it’s ok to highlight, underline, and make notes in the margin. Some of my biggest growth as a person came while reading and studying my Bible. In those quiet moments my heart and mind are wide open and His words pour over my heart and soul like much needed salve to a wound. It’s helpful right then to have a handy place to take notes. Writing in a journal is great, I’ve done that too. But I think it’s better to jot down your thoughts and feelings right next to the very words that impacted you so greatly. The Bible I’ve had for several years has markings like this all over it. I love going back and reviewing my notes to see how God spoke to me at different times and during different seasons of my life. 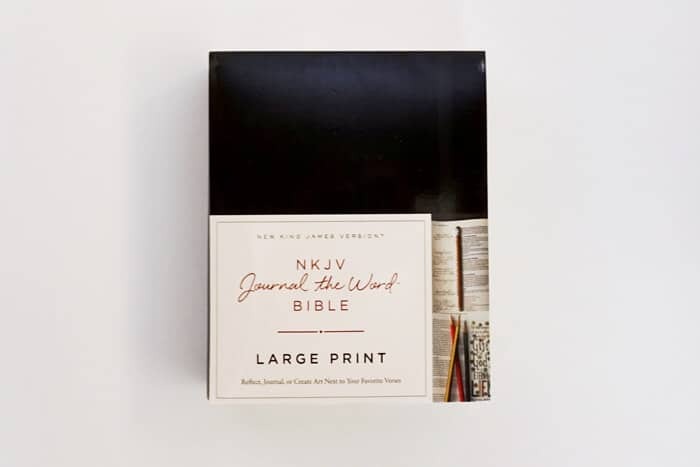 The NKJV Journal the Word Bible is available in many beautiful cover designs as well as Bonded Leather. And it’s also available in Large Print, which is great for the 40+ crowd like me 🙂 You can peruse the online options for this here. In the preface of the Bible you’ll read about the differences in the two translations. Also discussed are the ancient texts used to compile God’s word into the Bible we know today. I find it fascinating to read about the process used those many hundreds and thousands of years ago to keep the word alive. The scribes were very busy before mechanical processes were invented. Christian Bibles have two main sections; the Old Testament (OT) and the New Testament (NT). The OT is the period of time from Genesis (creation) up until the period before Jesus was born. The NT starts just before Jesus was born, through His ministry and follows His Apostles until the end of the first Century. 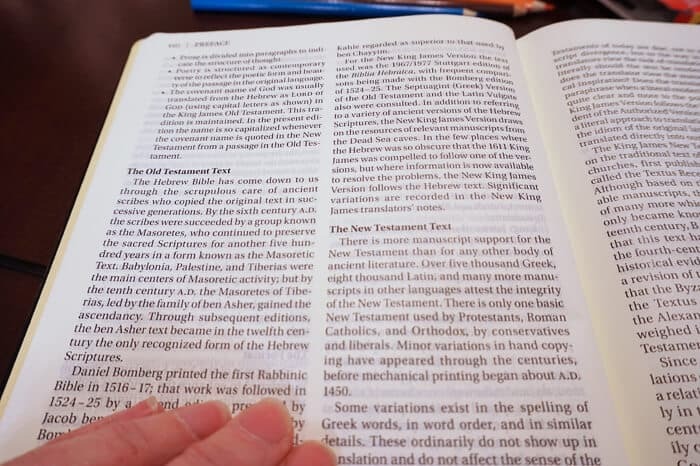 This Bible includes footnotes at the bottom of the pages. It’s also a Red Letter Bible. This means that all words spoken by Jesus in the New Testament are printed in red so they are easy to see and distinguish. Jesus’ words and teachings seem to just jump off the pages when they’re printed in red. And it’s a reminder of the blood that He shed for us. The pages are a bit thicker than a traditional Bible. Thicker pages means highlighters, pens, and colored pencils or markers will not bleed through to the other side. That’s often a problem with onion skin pages so this is a plus as far as I’m concerned. The margins are lined which is perfect for jotting down little notes. If messy lines bug you like they do me then you’ll love this too. There’s plenty of space to take notes, or do a little happy doodling. I hope you’ve enjoyed this review and are encouraged to crack open your Bible once again. Or maybe for the very first time? 🙂 You can find NKJV Journal the Word Bible online on Amazon in case you weren’t the lucky winner. Thanks for visiting today and remember you can review all the beautiful options here. 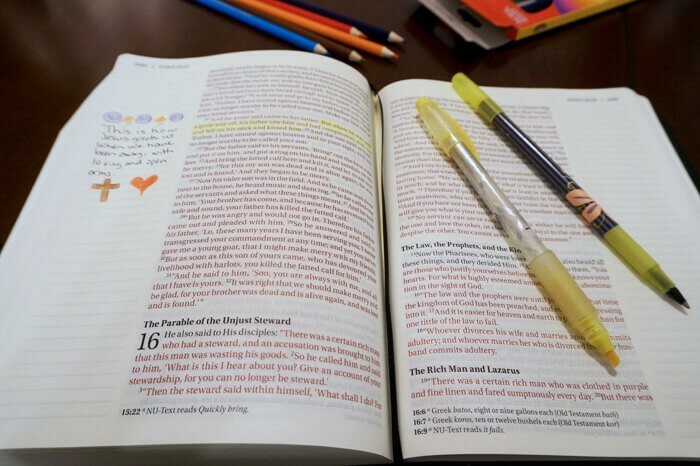 Do you write in your Bible? I’d love to hear what customs, habits, and traditions others follow. 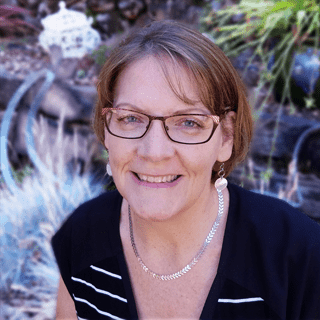 Thank you to Thomas Nelson Bibles for Sponsoring the Giveaway and the BlogAbout Blogger Network for making this happen!